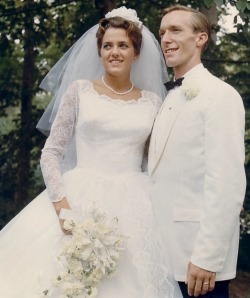 "Bill grew up in the bedroom community of Manhasset, LI, New York, while Patti grew up in the town next door, Great Neck, LI, NY. 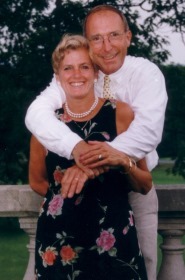 We met in 1962 and married in 1965. Bill worked for Hess Oil and Patti was a stay at home Mom. We moved to southern Vermont in 1970 from the north shore of Long Island. We had come to visit friends from our home town, Bob and Audrey Gregory. Our visit was so wonderful we decided to uproot our small family and relocate in the rural town of Halifax, Vermont. We bought our run down farm in the winter with a massive amount of snow on the ground. Spring brought flowers, green grass, our moving truck full of all our belongs and melted snow that revealed the fact that we had purchased a 3,000 car junk yard. "Most of our refurbishing/building projects are complete. We have raised our seven children. Our small working farm that sustained and nourished our growing family has now been converted into a beautiful six room bed and breakfast. "Stay tune as they say for more.... Patti." "You'll see lots of old delapidated barns as you travel throughout Vermont, remniscent of an early time when farming was the primary source of income. These decaying buildings now make for wonderful scenery. 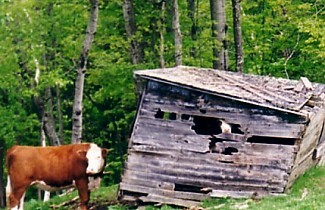 That's why we were saddened when we had to tear down the old barn (otherwise VT would charge us taxes on it). Lots of wonderful conversations with guests started because of that old barn."